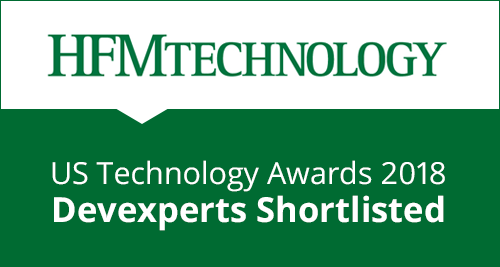 Devexperts is honored to be nominated for the “Most innovative technology firm” category at the HFM US Technology Awards 2018, alongside some of the biggest financial technology providers. The HFM US Technology Awards are designed to mark the achievements of technology firms and firms with technology heavy solutions and products that have shown exemplary service and innovation with hedge fund management clients over the period between 1 November 2016 – 31 October 2017. The winners will be announced at the awards ceremony which will be held on February 13, 2018 at the Yale Club in New York.